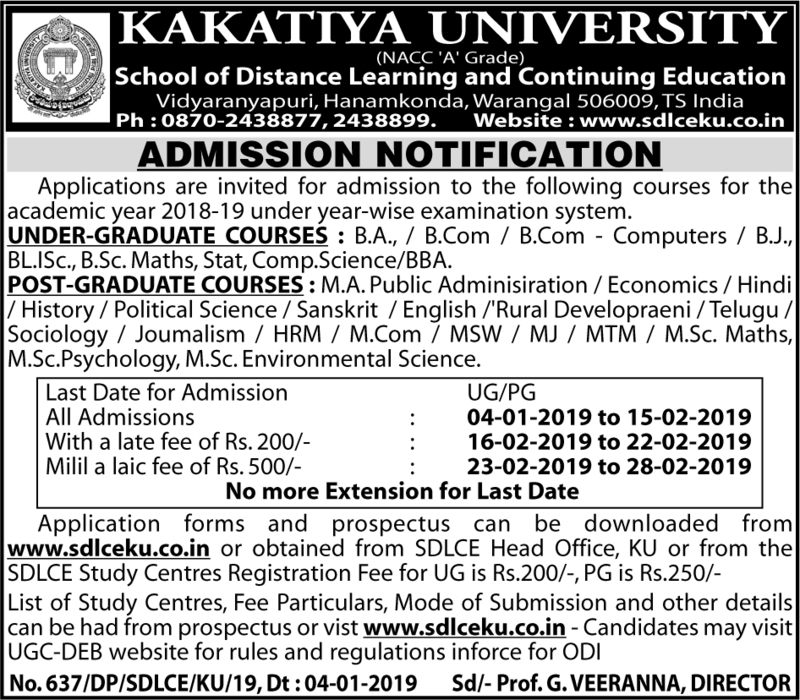 KU SDLCE Degree Admissions 2019, PG Admissions, UG, PG Admissions in KUSDLCE, PG Diploma Courses, KU SDLCE Admissions 2019, KU Open Degree, PG Admissions, KU Distance Degree, PG Admissions, KU SDLCE UG and PG Admission Notification 2019: Kakatiya University, School of Distance Learning and Continuing Education, Vidyaranyapuri, Hanamkonda, Warangal has issued Under Graduate and Post Graduate Admission Notification for the academic year 2019. ● పీజీ కోర్సులు: ఎంఏ (పబ్లిక్ అడ్మినిస్ట్రేషన్, ఎకనామిక్స్, హిందీ, హిస్టరీ, పొలిటికల్ సైన్స్, సంస్కృతం, ఇంగ్లిష్, రూరల్ డెవలప్‌మెంట్, తెలుగు, సోషియాలజీ, జర్నలిజం, హెచ్‌ఆర్‌ఎం), ఎంకాం, ఎంఎస్‌డబ్ల్యూ, ఎంజే, ఎంటీఎం, ఎమ్మెస్సీ మ్యాథ్స్, ఎమ్మెస్సీ సైకాలజీ, ఎమ్మెస్సీ ఎన్విరాన్‌మెంటల్ సైన్స్. ● అర్హత: డిగ్రీ కోర్సులకు ఇంటర్ లేదా తత్సమాన పరీక్ష ఉత్తీర్ణత. ఇంటర్ అర్హతలేనివారు యూనివర్సిటీ నిర్వహించే ఎలిజిబిలిటీ టెస్ట్‌లో ఉత్తీర్ణత సాధించాలి. పీజీ కోర్సులకు సంబంధిత సబ్జెక్టుల్లో బ్యాచిలర్ డిగ్రీ ఉత్తీర్ణత. ● అప్లికేషన్ ఫీజు: యూజీ కోర్సులకు రూ.200, పీజీ కోర్సులకు రూ. 250. ● దరఖాస్తు: వెబ్‌సైట్ నుంచి డౌన్‌లోడ్ చేసుకోవచ్చు లేదా దగ్గర్లోని స్టడీ సెంటర్లలో పొందవచ్చు. The notification for admission into degree and PG courses at Kakatiya University’s School of Distance Learning and Continuing Education (SDLCE) was released on. Vice-chancellor and registrar released the notification at the Committee Hall on the university campus. SDLCE Director said the Eligibility Test for direct admission into BA/BCom (general/computer) will be held on from 11 am to 1pm. The last date for submitting the application form is given below. SKILL & JOB Oriented COURSES(Certification & Diploma): Beautician / Drawing/ Advanced Diploma in Computer Applications / Mastering of Web Design/ .Net Programming / OOP (Programming)/ Tally/ DTP. Application forms and Prospectus can be downloaded from official website: www.sdlce.co.in or obtained from SDLCE Head Office, KU or from the SDLCE Study Centres. - For for M.Sc. Botany. Zoology, Chemistry /MBA /PG Diploma in Guidance and Counselling is Rs.500/-. 1. Candidates should take their seats at least five minutes before the distribution of the papers. Those coming half-an-hour after the given time will not be admitted. 2. The candidates is prohibited from bringing any forbidden material in to the examination hall. 3. He/She prohibited from either covering or communicating in any form with others in the examination hall owing the examination. 5. Preserve the Hall Ticket till admission. 1. Sale and download of applications and prospectus can be had from 01.04.2019 onwards.